19 February Devonport Library Associates reading with local writers Helen Sword and Julia Brennan. I read 'keep this book clean,' a poem about an old library book that survives in my family, and reprised shore space. 26 February Houses by the Sea: Robin Hyde in Wellington, with Lydia Wevers and Derek Challis. I read from Hyde’s sequence 'The Beaches' and talked about some of the textual discoveries made about the poems when I was working on Young Knowledge: The Poems of Robin Hyde. Listen to Helen Morse read ‘The Beaches’. 4 March launch for Michael Harlow's The Tram Conductor's Blue Cap at Parsons Bookshop, Auckland. Our Poetry off the Page students have now completed a digital translation of the title poem as a course assignment, which Michael has responded to with enthusiasm. 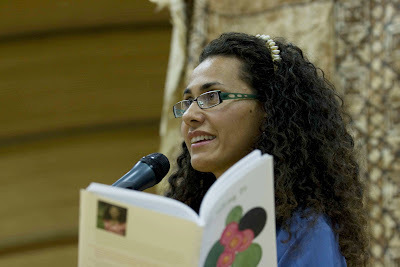 12 March launch for Selina Tusitala Marsh's Fast Talking PI at the Fale Pasifika, University of Auckland. The coordinator of Pasifika Poetry Web debuts her first collection with an accompanying CD of performance and music mixed and mastered by the redoubtable Tim Page. 14 March family wedding at Clearview Estate, Hawke's Bay, with a honeymoon in Mexico to follow. 20-22 March Creative Hastings Festival of Writers 2009 with Martin Edmond, Roger McDonald, Sarah Quigley, Karl Stead, Peter Wells, food writer Catherine Bell and wine writer John Saker. The matua tokotoko returned to home base and was passed around the Assembly Room again. 25 March MC for LOUNGE #6, 10 readers at Old Government House at the University of Auckland. LOUNGE features experienced writers alongside student writers, everyone reading five minutes for a free drink and an attentive audience. 27 March studio recording of 'peri poietikes / about poetry' for the BBC essay series A Laureate's Life, to be broadcast late April. The early morning-late evening link up to Bristol worked flawlessly, thanks again to Tim Page. 2 April MNZM investiture at Government House, Auckland for services to poetry. 5 April Poetry is News workshop for Michael King Centre Young Writers programme, Devonport. By the end of a fine Sunday afternoon there were chalk poems and young writers from North Shore schools on the pavements around the library. 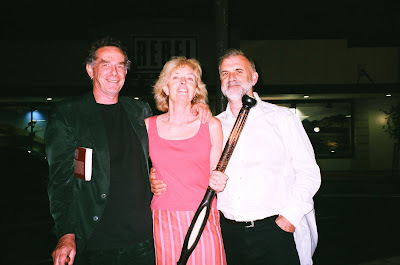 6 April the liberty of parrots goes live in Best NZ Poems 2008, edited by James Brown. 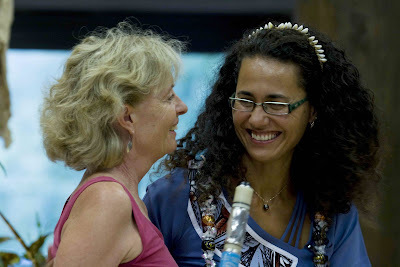 Michele & Selina Tusitala Marsh. Photo courtesy Godfrey Boehnke. Selina reads from Fast Talking PI. Photo courtesy Godfrey Boehnke. Martin Edmond, Michele Leggott and Mark Fryer with the matua tokotoko in Hastings. Photo courtesy Maggie Hall. 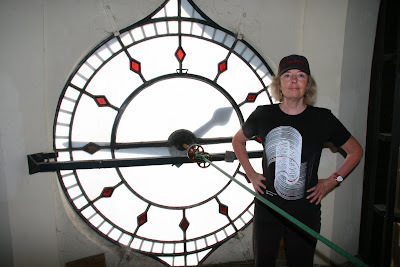 Michele in the clock tower, April 2008. Photo courtesy Tim Page.